Windows Vista/7: If you liked the ease of use and wizard-driven tweaking found in Vista Services Optimizer and miss it now that you've upgraded to Windows 7, you'll definitely want to check out the new Windows 7-friendly version. When you install Microsoft Windows for the first time, you will notice the low performance of your system. There are many reasons of performance problems in Windows, one of them that there are many of Windows services running in the background consuming CPU power and take up much space in the system memory (RAM) which we do not really need them at all. So I suggest to tweak Windows services by stopping and disabling unwanted services in order to save CPU power and system memory space. 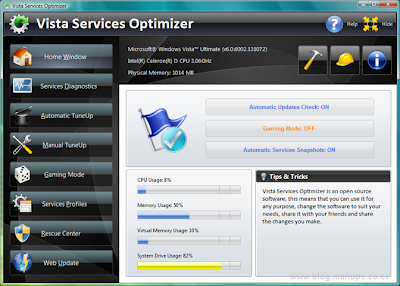 Vista Services Optimizer is an open source Windows tweaking utility that can improve your Windows Vista and Windows 7 performance and security with a simple mouse click, by tweaking Windows services in an automatic and very safe way according to the way you use your computer and which software you use. 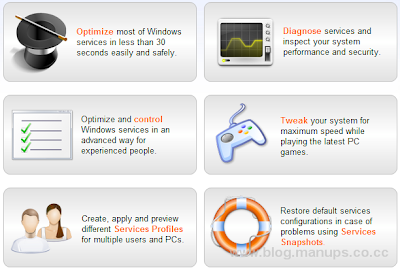 Vista Services Optimizer also enables you to tweak Windows services manually for advanced users who need more control over Windows services in an easy and safe way. Vista Services Optimizer provides you with detailed information about certain Windows services and enables you to use Google, Yahoo and Blackviper.com to help you identify some of Windows services function. Vista Services Optimizer is a safe tweaking utility which can optimize Windows performance and security without causing any harm to the system. If you face any problem after a services optimization process, you can with a single click, restore your system default settings using Smart Rescue Center.